The sand and dirt path to Karathona beach begins near Arvanitia, and meanders southward along the Argonic Gulf coast. The walking distance between the two beaches is roughly 2.7 kilometers, about a 30- to 40-minute trek. 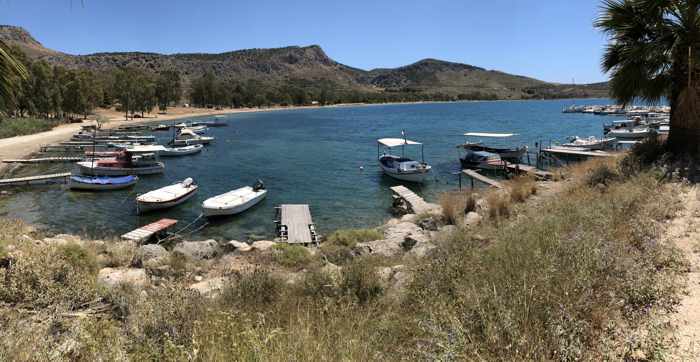 Boats docked in the north corner of Karathona Bay. From here, Karathona beach extends nearly 2 kilometers around the bay. It takes half an hour to walk from this spot to the south end of the beach. 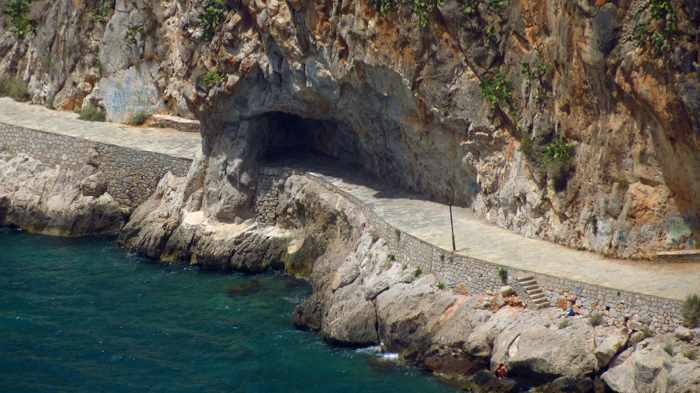 A separate, third trail leads from Karathona beach to Agios Nikolaos church, which sits on a windy slope above the sea. 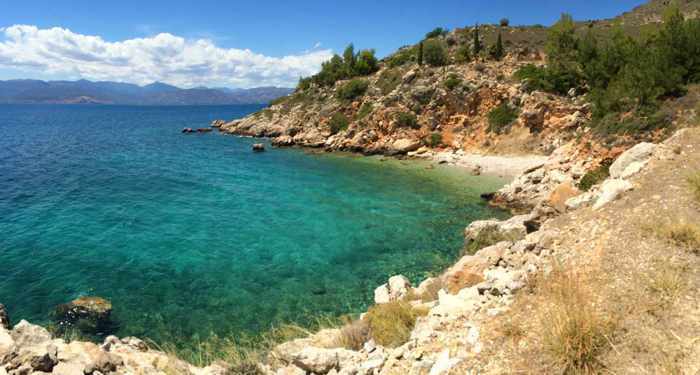 It’s a pleasant, short hike that’s worthwhile if you reach the south end of Karathona Bay and wish to view more coastal scenery before your return walk to Nafplio. Wonderful walks: Nafplio is commonly called “one of the most beautiful towns in Greece,” and rightly so — its historic Old Town is one of the prettiest places we have seen during our travels to more than two dozen islands plus a wide variety of places on the mainland and in the Peloponnese. With its picturesque alleys, lanes and streets, charming old buildings, impressive public parks and squares, myriad monuments and historic sites, and an extensive selection of restaurants, bars and shops, Nafplio is fascinating to visit, whether just on a daytrip or for several days or more. Though the town itself is lovely, one of the features we personally love most about Nafplio is the surrounding natural scenery — an exhilarating expanse of rolling hills and mountains, rugged rocky peninsulas and shorelines, and captivating sea colours in the bays, beaches, coves and harbours that indent the Argolic Gulf coast. 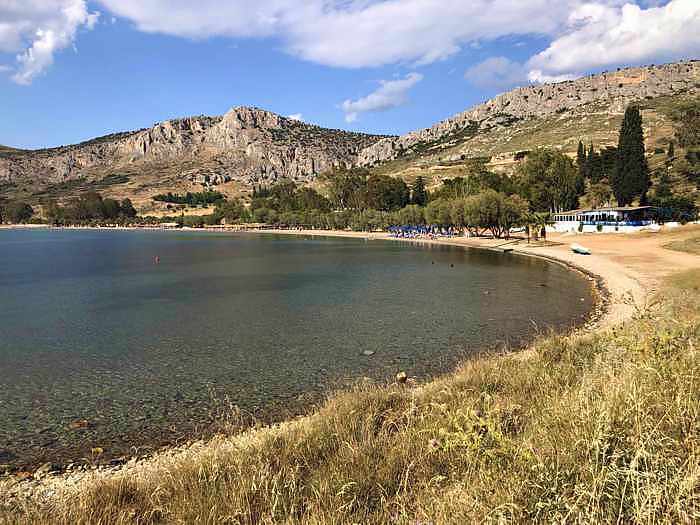 Walking is the best way to observe and savour the marvellous scenery, and Nafplio boasts two wonderful seaside paths that rank among our favourite coastal walks in all of Greece — the Arvanitia promenade, and the footpath to Karathona beach. We make a point of walking at least one of the paths each day we are in Nafplio. Aerial view of the Acronauplia peninsula’s south side. 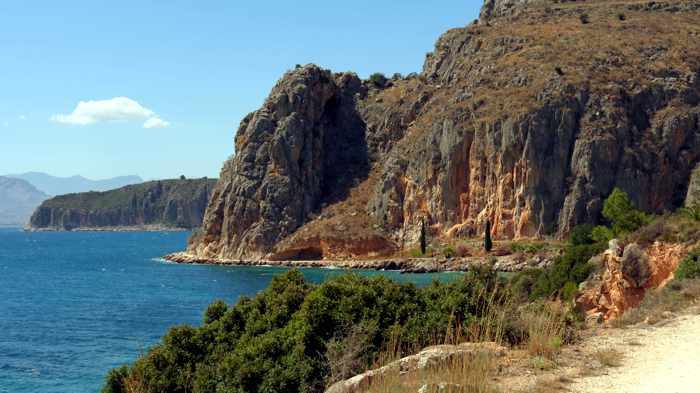 The Arvanitia promenade can be seen at the base of the rocky cliffs and is partially visible where it snakes through the line of trees above the shore. The walkway ends at a square above Arvanitia beach (bottom right). The Nafplio Old Town is positioned on the northern slopes of Acronauplia, a thumb-shaped peninsula that juts into the Argolic Gulf (a body of water between the Arcadia and Argolida regions of the Peloponnese). 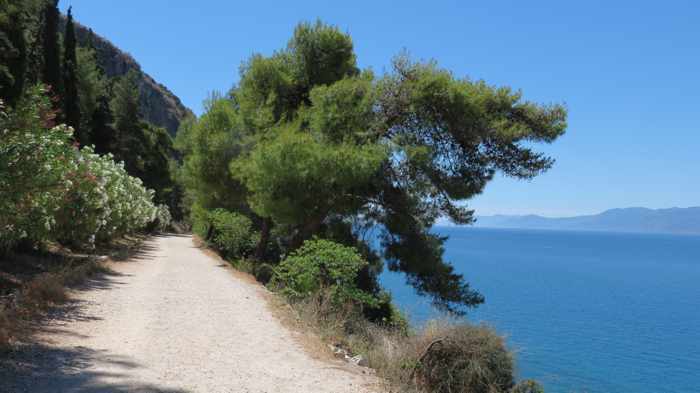 The Arvanitia promenade begins at the Nafplio waterfront area known locally as The Shore, and curves around the western tip of Acronauplia, hugging the base of imposing steep cliffs covered in wide swaths of prickly pear and other cactus plants. The walkway ends at Arvanitia Square, a walking distance of approximately 1 kilometer. The town’s popular sunbathing and swimming spot, the stone and pebble Arvanitia beach, is a short downhill walk from the square. The footpath to Karathona starts a mere stone’s throw beyond the Arvanitia beach entrance. As it meanders south, it passes above several coves and secluded inlets as well as the pebble and stone strands known as Neraki beach. The path is a favourite route for local residents to power walk, jog, cycle and exercise their dogs. At a casual pace, it takes about half an hour to walk the 2.7 kilometer distance to a small harbour at the northern tip of Karathona beach. 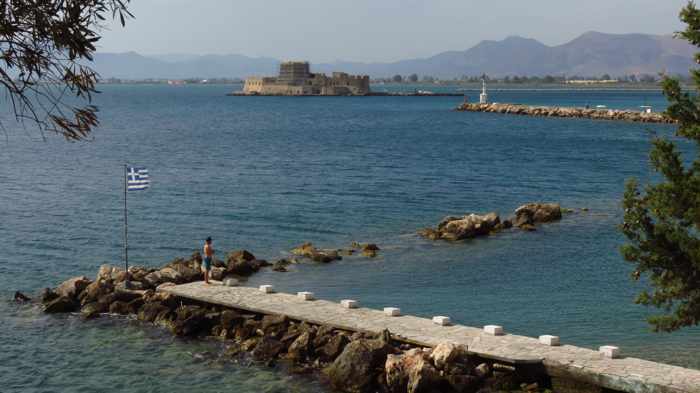 Strolling the Arvanitia promenade is often suggested as a “must-do” activity for Nafplio visitors, and we certainly agree. 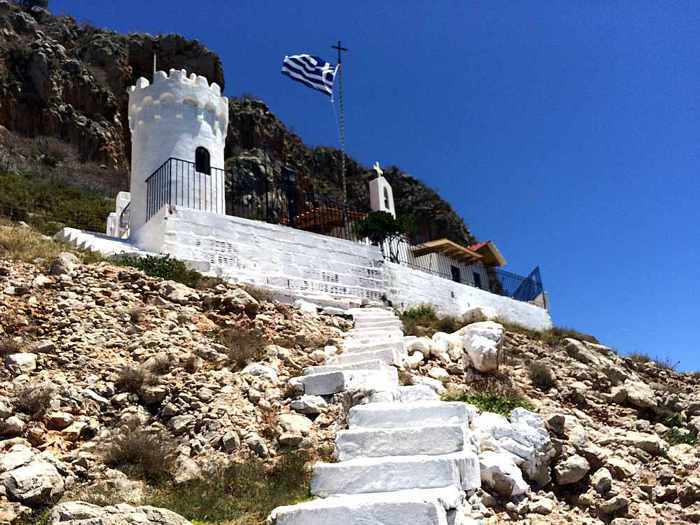 But we recommend that walking enthusiasts also make the invigorating hike to Karathona and onward to take a quick look at Agios Nikoloas Church. These walks offer a great opportunity to get some exercise and fresh sea air while enjoying the tremendous views of coastal landscapes and the Argolic Gulf. Please click on the links below to continue reading and to see many more photos of the Arvanitia promenade, Arvanitia beach, the Karathona path, Karathona beach, the trail to Agios Nikolaos Church and of course the church itself. Page 2 contains some general information about the walking routes, as well as photos of the Arvanitia promenade. Page 3 features photos of the Karathona footpath and Karathona beach. Page 4 has pictures of Agios Nikolaos Church and its access trail. Photo gallery: In my previous post, Falling for Nafplio, I described some of the elements and attractions that make the eastern Peloponnese port town of Nafplio one of our favourite places in all of Greece. 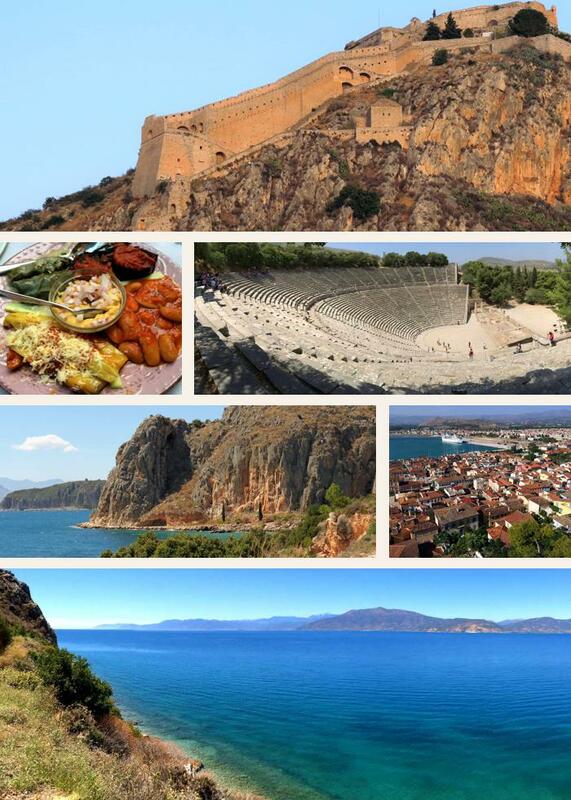 ♦ Nafplio’s convenient location for daytrips to other places in the Argolida region of the Peloponnese. 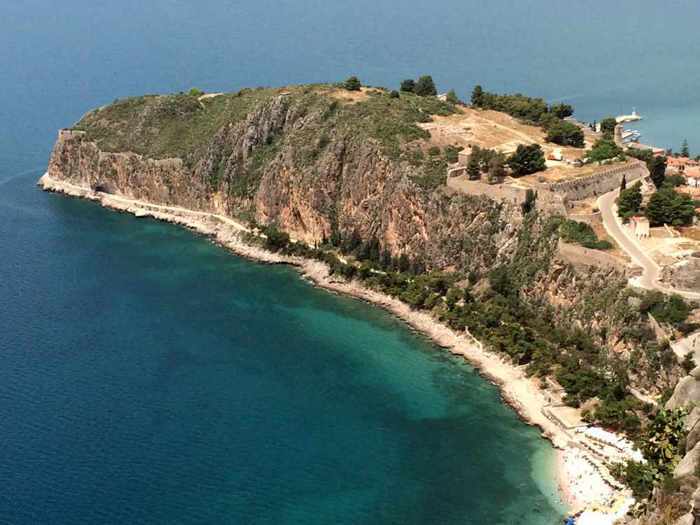 There are far more than 10 reasons why Nafplio is worth visiting, of course, but I will leave them for you to discover and experience yourself. I’m certain there will be plenty of things you will like about Nafplio besides those shown in our pictures. Please click on the link below to see the photo sets on page 2. 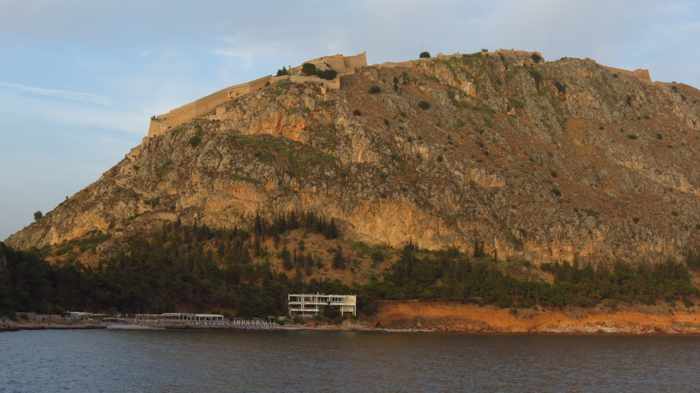 The Old Town of Nafplio rises on the north side of a steep peninsula, directly beneath fortification walls and buildings of Acronauplia — one of three castles situated in the historic town. Nafplio was the capital of Greece from 1821 until the country’s Parliament relocated to Athens in 1834. Fast favourite: It wasn’t love at first sight, but it was pretty darned close. Within minutes of arriving at Nafplio and walking from the waterfront car park into the historic Old Town area, we couldn’t help but wonder why it had taken us so long to finally visit what is widely considered one of the prettiest and most romantic towns in Greece. In person, Nafplio looked more beautiful and impressive than it did in the countless pictures and videos we had seen, and the Old Town’s historic ambiance instantly made us feel comfortable and welcome. As we wound our way down narrow lanes and alleys then up steep stairs to our hotel, we felt eager to drop off our luggage so we could get out and about to explore our scenic surroundings — even though we were sluggish and jet-lagged from our overnight transatlantic flight. 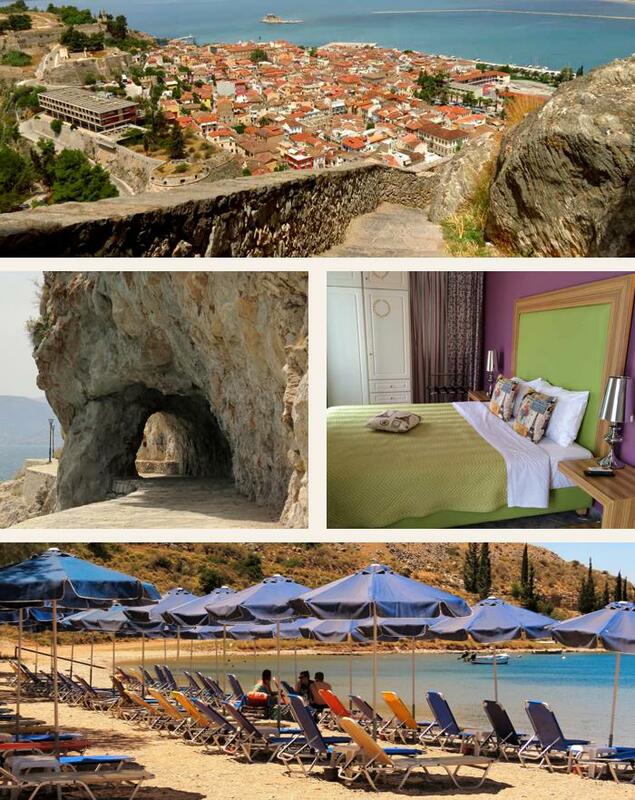 Napping would have to wait — we didn’t want to waste any time getting acquainted with Nafplio! After going for lunch with a friend and wandering around the town, we realized we were falling for Nafplio — in a big way. We had been there only a few hours, and yet Nafplio had quickly charmed its way into our hearts. By dinnertime, we were telling our friend how Nafplio had already become one of our favourite places in Greece. We had suspected that we were really going to like Nafplio — she had long assured us we would — but we’d never expected that we were going to love it so much, or so fast. 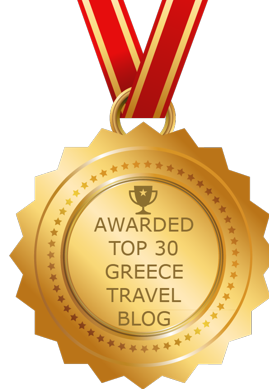 That was late May 2016 and, after more than a dozen years of island hopping holidays that usually concluded with time in Athens, we were making our first foray into the Peloponnese. We had scheduled Nafplio for the first full week of our vacation itinerary, but were concerned this might be too long. Would there be enough attractions and activities to keep us interested and occupied for seven days? Although I had read hundreds of online travel reviews and commentaries describing Nafplio as ideal for a daytrip from Athens, an overnight stay, or a weekend getaway, I couldn’t recall anyone recommending it for a week-long stay. But we didn’t get bored for a minute, and when it came time to depart for our next destination, we realized there were still quite a few sights and attractions we didn’t manage to see. We even felt a tinge of regret to be leaving with so much left unexplored. For us, one week in Nafplio simply had not been long enough. 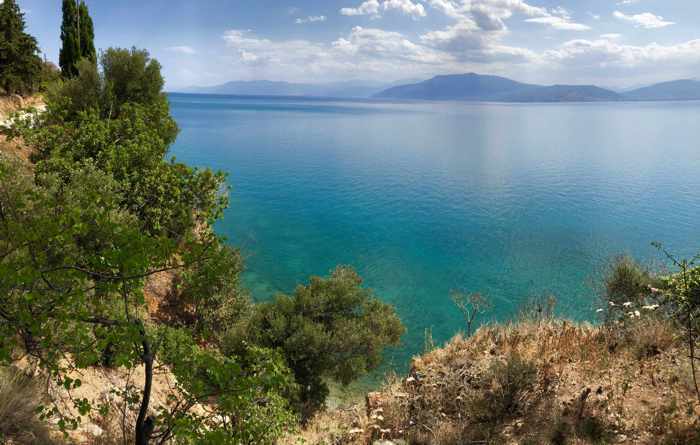 Now, nearly a year later, we continue to talk about how much we loved Nafplio, and we often discuss what we would like to see and do whenever we go back. Behind this palm tree at Syndagma Square stands the first Greek Parliament building. Towering above it on the hilltop are the clock tower and a stone fortification wall of the Acronauplia fortress. 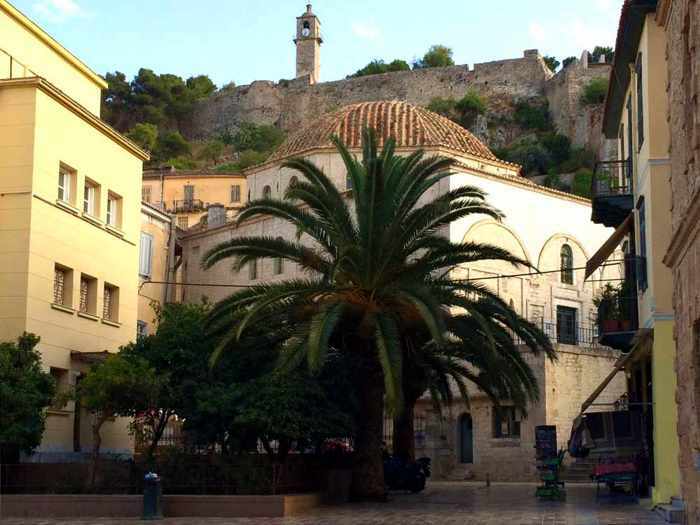 So what exactly did we like about Nafplio? It would be difficult to name just one or two main reasons, since there were so many appealing characteristics and elements that combined to make Nafplio such a perfect vacation destination for us. 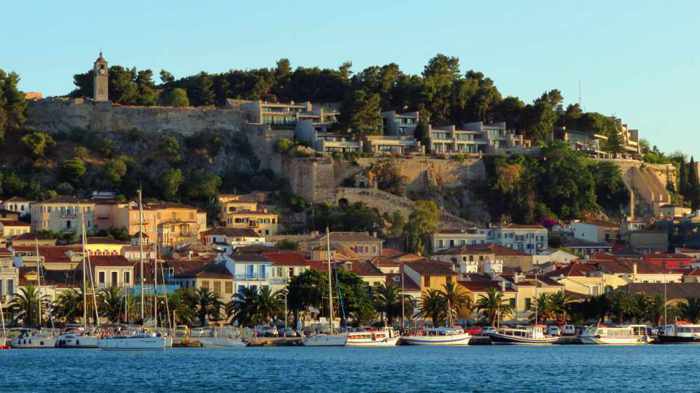 But I can easily describe the Nafplio features that rank among our favourites. There’s the Old Town, of course, which fascinates with its colourful streets and buildings, attractive parks and squares, historic sites and monuments (including three castles), and an extensive selection of shops, restaurants, bars and hotels. 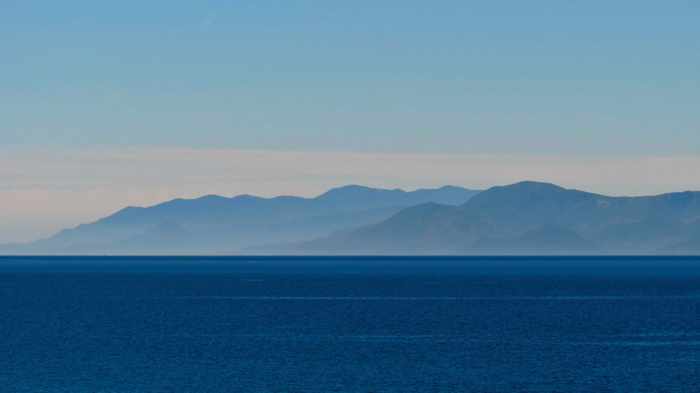 We also enjoyed the long waterfront walkways, the scenic coastlines offering plenty of places to swim in the tempting turquoise waters of the Argolic Gulf, and the exhilarating views of hills, mountains, sea and sky. I describe those features, and others, with a series of photos on page 2 of this post. Click here to see and read more about why we fell for this amazing and enchanting place. If you haven’t been to Nafplio before, this 10-minute video will show you exactly what you would see if you were to wander the Old Town’s charming streets, lanes and squares. The film was published in February 2017 by YouTube contributor Le Monde en Video. Extreme temps: We’re never happy after we return home from one of our Greek holidays, as we did three days ago — we always wish we were still in Greece. But this time we’re actually a bit relieved that we’re not there — we simply could not have handled the heat wave currently sweeping across the country. Sunshine and temperatures hitting the low 30s (Celsius) hindered some of our walking and sightseeing in Nafplio, Monemvasia, Tolo and Hydra on several days of our vacation from May 30 to June 16, but since we left Greece on Thursday temperatures have soared even higher, approaching and even exceeding an absolutely sweltering 40 degrees in many places, particularly on the mainland. On Saturday, for instance, the temperature reached 43.4 at Sparta, which we had found hot when it was in the low 30s during the day we spent there. As I write this post today, it’s 37 in Nafplio, where a few 30-degree days forced us to limit our activities during the first week of June. And temperatures are forecast to remain scorching hot for several more days. 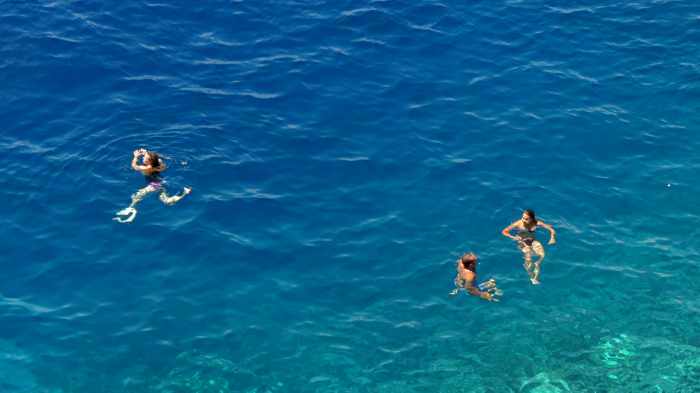 If we were still in Greece, we would either be hiding inside our air-conditioned hotel rooms, or swimming as much as possible. Fortunately there were plenty of excellent places to take a dip in the sea at most of the destinations we visited. 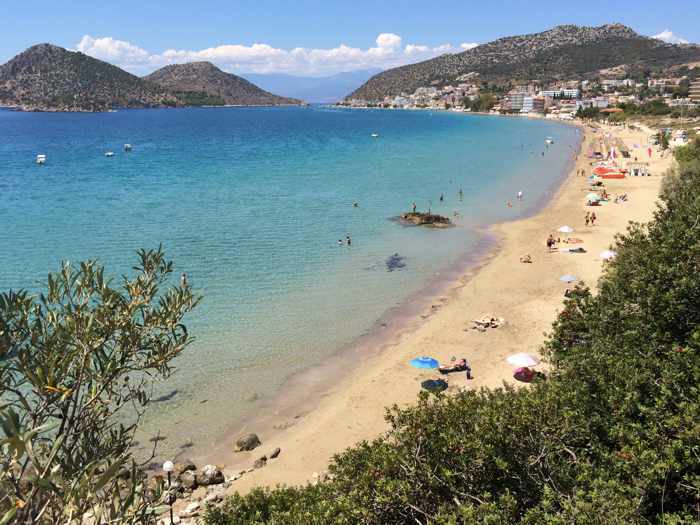 Click on the link below to turn to page 2 and see photos of the great swimming spots we discovered near Epidaurus, Hydra, Monemvasia, Nafplio and Tolo.